"The chancellor is one of several senior members of Theresa May's government who have become increasingly concerned about the risks of a no-deal Brexit", says the Guardian. And to that, one can only remark: "you don't say!". Can it really be the case that the chancellor is only getting to the point where he has become "increasingly concerned" about the risks of a no-deal Brexit. With all the information available to him, why doesn't he already have a settled view? Certainly, the outgoing chief executive of Airbus, Tom Enders is under no illusions about the effects of a no-deal on his company. He warns that it would trigger "potentially very harmful decisions", with the company forced to "redirect future investments" after a no-deal. Being very modern and high-tech, Enders conveyed his message in a video, in which he also said: "Please don't listen to the Brexiteers' madness, which asserts that because we have huge plants here we will not move and we will always be here. They are wrong". He acknowledges that it is "not possible to pick up and move our large UK factories to other parts immediately", so in the short- to medium-term, wing production will stay in the UK. However, he says, aerospace is a long-term business, adding: "Make no mistake, there are plenty of countries out there who would love to make the wings for Airbus aircraft". Airbus isn't the best of friends to the Eurosceptic movement and there is a political edge to its business. The amalgamation of aerospace companies on a Europe-wide basis has gone hand-in-hand with European political integration, and the operation has become something of a "trophy business" for the EU. However, like it or hate it, the company is one of the UK's biggest manufacturers. It employs something like 14,000 people and another 110,000 work in its supply chain in the UK, providing everything from advanced, stress-bearing composites to first aid materials for the company clinics. It has factories in north Wales, Stevenage, Portsmouth and Bristol. 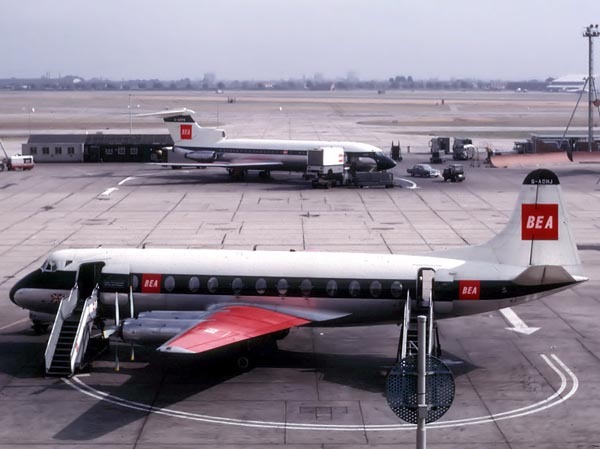 Of course it would be nice to have a British-flagged aircraft industry, where we rolled out complete aircraft of our own, as we did in the days of the de Haviland Comet, the Bristol Britannia and the Vickers Viscount (pictured - Trident in the background). But the world ain't like that anymore, and there is no such thing as a truly national industry. Even US aerospace companies source components from overseas, while Airbus has a manufacturing operation in the United States (and China). Thus, we can't afford to mess about with companies such as Airbus. Even if we might have long-term plans for revitalising the aerospace sector, we have to look after the short and medium-term as well. It really doesn't make sense to junk the jobs of today – especially high quality jobs – in the hope that something better might turn up in the future. That really was what Flexcit was all about. I didn't support the Single Market, as such – proposing that, in the longer term, we abolished it and replaced it with a genuine, Europe-wide area, dedicated primarily to trade rather than as a means of leveraging political integration. Already, in June, Airbus was complaining that, in the absence of clarity, it would have to "assume the worst-case scenario". And in his current message, Enders is saying that, it was a "disgrace that more than two years after the result of the 2016 referendum, businesses are still unable to plan properly for the future". Not without some justice, he then adds that, "If you are really sure that Brexit is best for Britain, come together and deliver a pragmatic withdrawal agreement". And if it was never the case that any business (and especially a multinational corporation) had any right to tell us how we are governed (as in whether or not we leave the EU), it is perfectly reasonable for business to ask for and expect a stable trading environment. But there is an issue here which has not been fully or properly rehearsed – the role of regulation and the regulators. When it comes to high-tech, safety critical industries, regulation is not an end-of-process add-on. Safety, as defined by regulation, is built into the product at all stages, from raw materials to basic components such as screws and fasteners, to sub-assemblies and functional parts like engines, instruments, radio sets and radar. When it comes to the continuing presence of companies such as Airbus – and engine suppliers such as Rolls-Royce – being outside the Single Market isn't just about access to a larger market, with frictionless trade across borders. It is about being able to work seamlessly with the EASA network, of which the Civil Aviation Authority is currently part. The curious thing is that, when it comes to technical regulation, and its implementation, we are rather good at it. Companies new to the game, which have the opportunity to pick their own regulators – such as car companies which can choose which national regulator awards the type approvals for their products – have been known to pick the UK. This was the case with the Czech-based Skoda, which had used the UK's Vehicle Certification Agency (VCA) for all its recent models except the Karoq, Kodiaq and Citigo. But last March, in a little reported development, Skoda announced it was to stop using the VCA, "due to uncertainty over its post-Brexit powers". It will now use the Czech ministry of transport for all future vehicles. The thing is that regulation is a business in its own right, the VCA earning just over £20 million in the last accounts period. The CAA is an even more lucrative operation. For the year ended 31 March 2018 its total income was £190.7m of which £84.5m was statutory income generated under the statutory charges schemes. When these agencies are outside the EU, though, a lot of that regulatory income will melt away. Aston Martin, for instance, has also decided to dump the VCA and doubtless many more UK-based manufacturers will follow. But, more importantly, because of the close relationship between industry sectors and their regulators, the industries tend to go where the regulators are based. This is already happening with Rolls-Royce, which is to move its design approval process from Derby to Germany, to guarantee that powerplants can be approved under European regulations post Brexit. Much the same is happening with the European Medicines Agency, moving from its current location in London, where it employed 900 staff in its Canary Wharf offices. It is relocating to the Netherlands in early March this year. Many of the pharmaceutical companies which have located their headquarters and operations in the UK are likely to follow. Those that remain are likely to lose valuable evaluation work. Of course, for the hard Brexiteers, this is all "red tape" from which British industry will be "liberated" once we leave the EU. But that is fundamentally to misunderstand the nature of such regulation. Without the reassurance of independent regulatory certification, markets contract, not only at a European level but also worldwide, in countries which also use EU certification as the basis for their own market access. I recall once working for a UK company marketing a novel disinfectant product in the days before there was any UK or EU regulatory approval system. In order to gain access to its own domestic market – and lucrative NHS contracts – it became necessary for the company to submit its product voluntarily to US FDA approval. Post-Brexit, without the cover of the European system, many British companies will have to resort to similar stratagems, especially if they seek to market their products internationally. To that extent, regulation is not a burden. It is an enabler. Yet the way we are handling Brexit, with the prospect of a no-deal, is potentially going to crash a huge spanner in the works. The minimal savings from reduced EU "red tape" will be absorbed in duplicating regulatory systems at a domestic level, while we then have to seek separate international approvals at additional cost. And yet, Mr Hammond is only "increasingly concerned" about the risks of a no-deal Brexit. Do we have any politicians in our government who have the first idea of what they are dealing with?